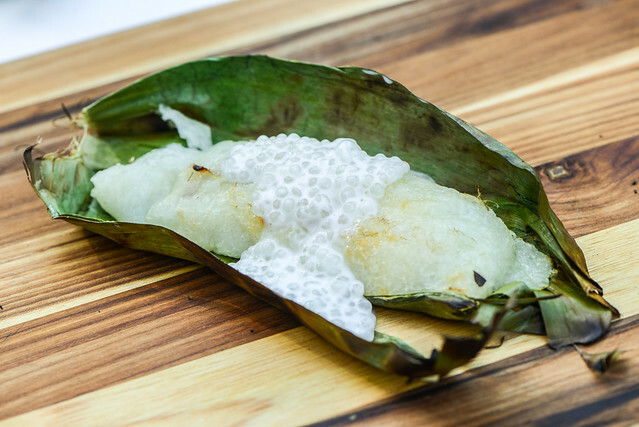 I remember when Pok Pok opened in New York—I had heard so many good things about this Thai restaurant, which had already been established as a shining star in the Portland scene, that I couldn't wait to go try it myself. Assuming opening crowds, I decided to hold on a visit for a bit, but then days turned into weeks, into months, into years, and I left New York without having ever ventured to Cobble Hill for their food. A renewed excitement brewed though when I noticed the only destination shopping my wife wanted to do on a recent trip to L.A. happened to be in the same building as the Pok Pok there, and with a mere hour or so between a wedding ceremony and reception, I made that time really count with a quick stop in to finally try it out. Out of everything at Pok Pok, I've heard and read most about their Vietnamese-flavored, fish sauce laden wings, so that was going to be my go-to order until the wife worried that the combination of wings, my one really nice suit, and less than graceful eating habits may be a recipe for disaster. So instead we got some incredible salty and savory ribs (I didn't see ribs as a much better option, but I relented) and left my first Pok Pok experience both pleasantly pleased and slightly disappointed I missed out on the wings. 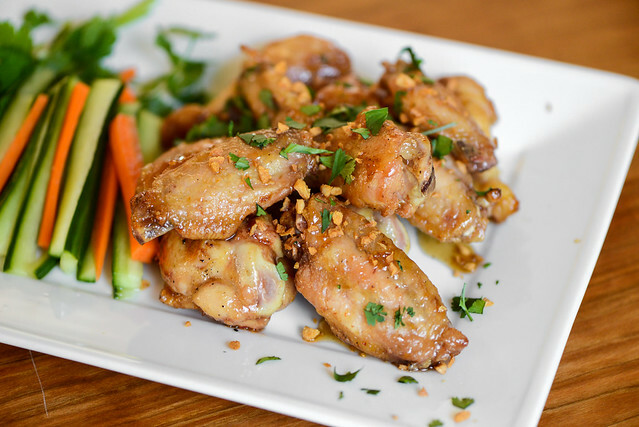 So now, months later, the thought of those wings has continued to stir in my brain, which led me to create these grilled savory Vietnamese flavored wings. When I arrived in New York for college, my diet pretty much consisted of various forms of fried chicken and pizza. To say I was a picky, not adventurous eater is a bit of an understatement, and, more-or-less, I was able to keep my horizons from expanding during my tenure as a student. The one big exception was when my Vietnamese roommate wanted to head to Chinatown for some of his own comfort food. 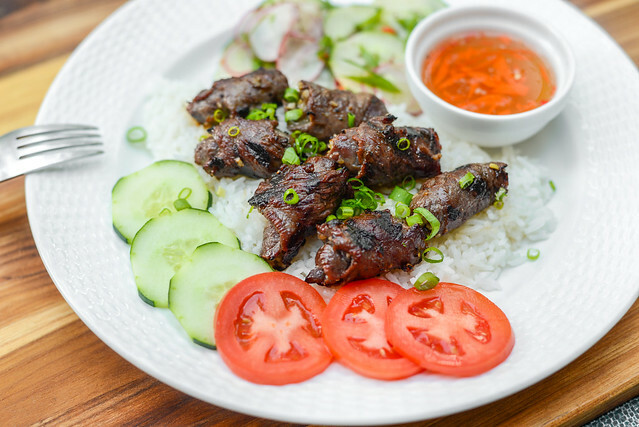 Me being who I was, I gravitated to the one thing on the menu that sounded familiar and non-threatening—barbecue beef over white rice—and that's what I ordered year after year every time we ended up at this spot. Since then I've obviously expanded my palate and other items have replaced this once mainstay for me, but I recently had a hankering for it and since I'm no longer located in New York, it was up to me to recreate it the best I could. The past month here in Durham has been filled with perfect 70°F days basked in blue skies and sunshine. Sitting outside in the beautiful weather, I've watched the barren trees bud, bloom, and now mostly turn green. This onset of spring has also bought with it a desire to transition my diet of heavy and greasy foods into the realm of lighter delights. 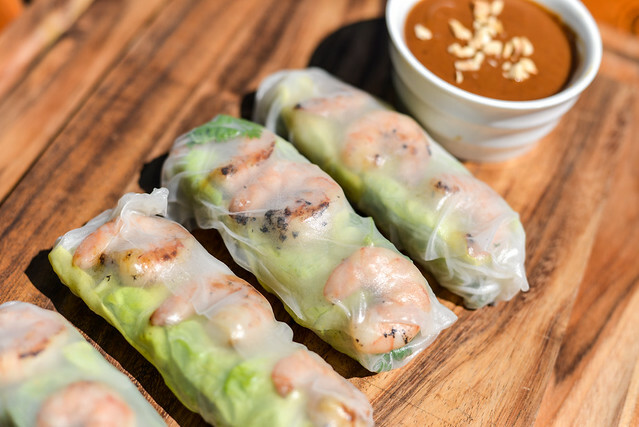 It's an unusually early change for me, as I'm used to it commonly happening around late May back in New York, but it's certainly welcomed and these Vietnamese grilled shrimp summer rolls are a great way to welcome the bounty of spring. I was late to jump on the banh mi bandwagon, so much so that the all out craze they had going so many years ago was breathing its last breath when I finally joined. Still, my first taste of one of these Vietnamese sandwiches was a revelation—the contrast between the sweet and salty meat, pickled diakons and carrots, fresh cilantro, and airy, crusty bread was nothing short of spectacular. 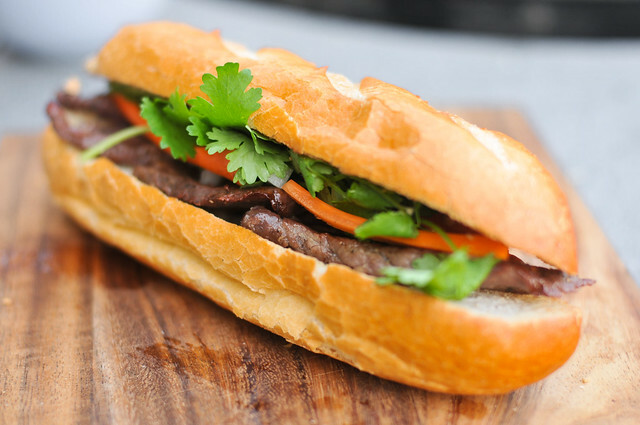 Whether in or out of food fashion, I still think these are royalty among sandwiches, deserving continued prominence, which is why I'm bringing you this grilled steak banh mi today.